You are here: ITarian RMM What is RMM Software? RMM Software, also referred to as network management software is an application that provides MSPs (Managed Service Providers) complete visibility and control over the networked systems they manage. RMM software enables remote endpoint monitoring, remote desktop sharing, PSA (professional services automation), automatic support ticket generation and management, and policy and job definition. 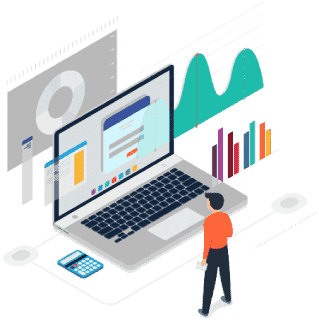 Many companies today have the need for some kind of remote management and monitoring, and MSP RMM software can provide a great deal of assistance. However, when you check out these programs you will find many different types and there are so many choices it can be very confusing. So what can you do? Today's IT companies have many responsibilities and some jobs are still done by hand. For example, when you need to upgrade software programs you cannot always upgrade immediately and some upgrades must be done manually. However, thanks to the patch management functions of top RMM software, you can schedule upgrades at the most convenient time, and this can all be done from the control panel. Does your staff spend a great deal of time with customer support? If your people are answering phones and taking care of the help or service desk it can sometimes be enough to keep more than one person busy full-time. So, what is RMM software designed to do? It can provide you with an automated service desk, and this is the reason for ITarian's Service Desk Module. 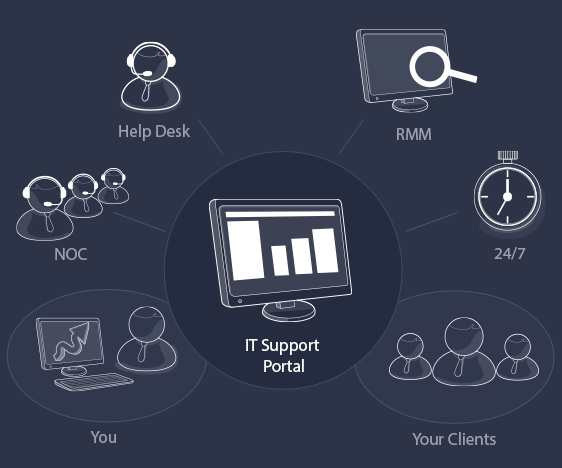 Service Desk gives you the opportunity to provide your customer with your branded portal. Customers can log in to the system and create their own trouble tickets, which are automatically prioritized, routed and tracked. This gives you a 24 hour customer support feature without the need to pay people around the clock to be there. Support tickets can be accessed from a number of sources when you use ITarian RMM software. For instance, you can use the phone or email and they are available from any endpoint. Plus, if you are traveling or away from the office, you can access the system any time you like with ITarian's mobile app. An MSP is there to provide excellent service by solving clients' problems. When there is an IT problem reported, you (as the MSP) must take care of it and with the least amount of interruptions to the client. After all, this is what you are being paid for and "downtime" is a word which should not even be in your vocabulary. A customer's employee downloads a simple program to expand his clipboard capacity (to make copying and pasting easier). However, his computer does not recognize a small malware program inside. With enhanced monitoring systems like ITarian, this program will be spotted and quarantined, so it won't be allowed to spread throughout the company. This is only one example, of how your RMM software can solve issues without bothering the client or causing downtime. A managed service provider has more things to do than monitor and manage networks. You still need to conduct a business, send invoices, deal with vendors, pay employees and many other things. What is RMM software going to do about automating professional services? Some programs (like ITarian) are designed to integrate PSA features with remote monitoring software. This is why you get an automated service desk module and you can use the quote manager module. The quote manager is designed to integrate with your program and makes service quotes easy to create and track. And to simplify invoicing, you can use Quick Books with the program. What is RMM software going to do about the mobile market in the 21st Century? Think about this. Do you know anyone who doesn't own a smart phone, laptop or tablet computer? Chances are, most business people own all three of these mobile devices and they are one of the best ways to keep in contact with your staff when you or they are not in the office. However, all these devices are part of a business network and an MSP must be responsible for their safety and security as well. These four RMM software features are essential to any MSP business and there are more features you should check out today. Visit ITarian on the Web at https://www.itarian.com/ or call (973) 859 4000 ext 3025 about a live demo.